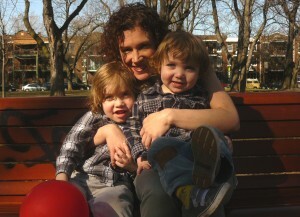 My name is Shauna Hardy, I’m 42-years-old, living in Montreal and working as a freelance writer. I have two unbelievably fabulous, rambunctious boys: Tristan is four-years-old and Raphael is two. There is a really fantastic quote from Bonnie Raitt that goes something like this: Only go as fast as the slowest part of you can go. I adjusted it slightly: I can only go as fast as the slowest part of my family can go. Raphael is only two, he’s still in diapers, still doesn’t sleep completely through the night. Our family mantra has allowed me to gain perspective. It means that I’ve been able to lower my expectations and enjoy every moment as it passes, instead of agonising whether we are going on enough play-dates, whether I’m stimulating my children enough, whether I’m striving hard enough as a mother. It’s allowed me to simply enjoy my children for who they are without measuring my skills and their development against some ridiculously high standard that probably only exists in my mind. Joy. Nothing gives me more pleasure that seeing my children laugh. I try to approach our lives with a great sense of adventure and teach them that there is fun and wonder in (almost) everything they do. Childhood inspires me – being with the boys has given me an added sense of enthusiasm for the simplest things – chasing each other in the park, jumping up and down simply because we’re going to eat popcorn, or having cuddle time on the couch. Since I’m generally up before the crack of dawn, coffee is my very best friend. I always set the timer on the coffee machine so that when it’s time for me to get out of bed, hot coffee is brewing and filling the house with that amazing smell. The fact that the coffee is ready and waiting for me feels like a gift and I’m always a little happier for it. None of this will last forever – the sleep deprivation, the frustrations, the joys and those sleepy first-of-the-morning cuddles. Don’t overthink things, don’t worry about how it all will get done and how it will all turn out. Put one step in front of the other and just enjoy the moment that is staring you in the face. And if it’s not a particularly good moment, just let it pass on by. As far as I am concerned, there is no such thing as creating an absolutely happy day when you’ve got small kids. There will be moments of squabbling and there will be tantrums and tears, but that doesn’t mean that there won’t also be moments, sometimes hours of absolute perfection. Focus on those, cling to those and make them your best memories of what it was like to raise children. When time feels like it’s slowed down and I have a chance to just watch me children grow. I love watching them discover the world around them and discovering each other. Their enthusiasm is boundless and the fact that they want to share it with me is one of the best gifts that life could ever have offered me. The responsibilities of being a parent are huge and, as a single mom, it can feel completely overwhelming at times. I’ve learned to ask for lots and lots and lots of help. From friends, from babysitters, from anyone who was willing to listen. I try as hard as possible to carve out a little bit of time when I can to do things that I truly love – that usually means talking on the phone with a dear friend or falling asleep while reading a couple of paragraphs from a good book! I have two. There is the moment that both boys come tumbling into my bed in the morning. I am surrounded by warm bodies and snoring and we all get to greet the morning together. At some point there is usually some tickling involved and then we usually have to make a tent with the pillows and covers before we all get up. The other moment comes on most days when I’m making dinner. This is tv-time for the boys and I usually have some music going in the kitchen. Tristan and Raphael at some point will come into the kitchen and dance with me. I love being able to sing to them and spin them around and around and around in my arms. Not all the time, and certainly not with very young children. I think it’s something to strive for and I think it’s something to cherish when it happens. I think there can be moments of balance, where everything just feels that it’s fallen into place. The children are happy, deadlines are met, dinner is ready and I’ve had a chance to visit with a friend. But I also know that anything could happen in the next 12 hours that will throw everything out of whack – that’s why it’s best to just ride the wave and enjoy the laughter as it occurs. I don’t have one single guardian angel; I have a whole community of them. My angels are the ones who are always willing to give my boys a little extra love when I’m feeling tired and are always there to make me laugh, cheer me on and bring me food (and cake, I never, ever say ‘no’ to cake). With Tristan it was when he asked me if I could go to the store to buy him some money for his piggy bank. With Raphael, it was when I asked him what his name was, his answer: “Meeeee!!!!”. My greatest wish is that you both find your own voices and that you choose to follow them. Remember that I’m not interested in what you should be or how you should live; I’m interested in what you want to be and how you want to live. Love is everywhere that you look for it and thanks to that, you will never be alone. Be kind, kiss often, hold hands at every opportunity, laugh out loud at least three times a day, and when all else fails, cake and ice cream can solve just about anything. And remember, above all else, that you have made my heart grow bigger, stronger and capable of more love than I even thought possible – I am eternally grateful for what you have given me and for how you’ve helped me view my life. I will love you forever. 1. I fell in love with jcrew.com after Tristan was born and we have been in a VERY committed relationship ever since. Classic styles with just a little bit of sparkle and fairly good sales. It’s also the perfect for a little late night fantasy window shopping. 2. Have I mentioned that I need coffee to get me up in the morning? When I was given a Cuisinart coffee maker, I thought it was a ridiculously exorbitant price to pay for a simple machine. Three years later – I thank my lucky stars every day that I have it. The timer and a super-hot setting means that I have amazing coffee every single morning. 3. If I’m vain about anything, it happens to be my skin. I discovered Ole Henriksen skin products a few years. His anti-ageing line is amazing and it smells divine. It’s a little bit of pampering that I don’t mind indulging in. 4. Speaking of beauty – I can’t get enough of Sephora. There’s a downtown store, but I love shopping online and finding fun beauty finds. And when the box arrives at the door – it kind of feels like Christmas, even in July!!!! 5. There are few things in this world that I love more than a good book. As a writer, I’m obsessed with words and when someone can tell a good story, it just fills me with awe and a quiet joy. I read Rules of Civility by Amor Towles, a few months ago and it still haunts me. Every time I opened that book, I fell into another world and it was such a beautiful world. His descriptions, his characters, his story – it was pure perfection. I can’t wait to read it again. 6. Like my coffee-maker, I also bless the makers of Netflix, every single day. I love that the kids can find amazing commercial-free programs that they love and I love that I can watch full tv-series whenever I wish. I don’t have the attention-span or the patience to wait a week for the next episode in a series. With Netflix, I’ve been able to see some amazing programming on my own time schedule. 7. There’s a channel on Youtube called Kidstv123. It has all sorts of fun songs and great imagery. As a motivator in the morning, I tell Tristan and Raphael that we can sing a few songs before we go to daycare. It’s a really nice way to start the day, and because they are so short, we can squeeze in 2-3 without feeling rushed. 8. Sleep deprivation doesn’t make me feel very pretty. But then I discovered bright lipstick – reds, pinks, corals – it takes two seconds to put on lipstick, but it is an instant mood-lifter and it makes me feel fabulous. I’m hooked!!!! !